The battery in your vehicle is needed to get that vehicle started up and you know that you have to care for it in every way possible. Day Apollo Subaru wants to make sure that you informed about your battery, how it works, and how extreme temperatures can affect it. When the weather is extremely cold, the capacity of your battery will decrease. This will keep it from working in the way that it is meant to. When the weather is extremely warm, the capacity of the battery will increase. This can still cause issues for your battery and your vehicle. Keeping the battery charged and providing it with the maintenance that it needs can help that battery work well both in the winter and in the summer. 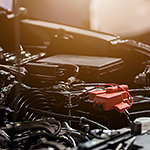 If you are looking for help in caring for your battery or handling other vehicle service needs, contact our team in Moon Township, PA to receive the best possible care.